VICTORIA, Tx. 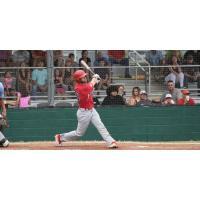 - In a dramatic winner-take-all finale, the Acadiana Cane Cutters fell to the Victoria Generals 7-4. Acadiana began the game with a double from second baseman Mason Corbett (Texas A&M) who was then driven in by right fielder Cole Secrest (Lamar University). Corbett also scored run number two in the third inning on an RBI single off the bat of Nathan Gabryszwski (Lamar University). Chandler Morris (Texas A&M) was driven in by Kyle Bayles (Mississippi State) in the fourth after he tripled off the center field wall. The last run for the Cutters came by the way of a solo home run hit my Gabryszwski in the fifth. Ragin' Cajun Jimmy Dobrash started on the mound and pitched four complete innings, striking out four. The Cane Cutters battled to the last out but could not rally. Head Coach Joey Satriano spoke about the closeness between the players and the coaches this summer. "I told them ten days ago, win or lose, as long as we compete and fight, that's what it's all about," said Satriano. "Whatever team it is, it happens to be this team, just being around competition, being with a bunch of guys that know how to fight and know how to compete, that's the best part." The Acadiana Cane Cutters would like to thank all their sponsors, host families, fans and everyone that made this summer a success! We are looking forward to another great season next year!